Why didn't Jesus forego the fast to begin his ministry? The answer that I hear the most is that Jesus endured this period of fasting in order to prepare himself for his earthly ministry which was about to begin. While this isn't completely unrealistic considering the general concept of fasting (to focus one's mind on a particular situation), did Jesus, as the Son of God, have a spiritual need for such a challenge? Perhaps the temptations he endured would prepare him for his encounters with the Pharisees, Sadducees, and other scoffers. This argument is a little shaky to me. One source believes his temptations serve to fulfill what was written in I Corinthians 15:22 - For as in Adam all die, even so in Christ all shall be made alive. At the end of this period of fasting and prayer, in Christ's weakened human condition, Satan came to tempt Jesus, the "Second Adam," just as the first Adam was tempted in the Garden of Eden. At least this answer makes me think a little more than the first option. Perhaps Jesus' temptations were Satan's attempts to cause Jesus to sin, which presumably would have disqualified Jesus as the Davidic Messiah. This raises the question of whether Jesus was capable of sinning; but that's another blog post entirely. Through his chosen temptations, Satan tried to convict Jesus of three crimes: gluttony, hubris, and avarice. Most know that gluttony is excessive eating and hubris is pride. Avarice is extreme greed for wealth or material gain, as when Satan took Jesus to a tall tower and offered him the kingdoms of the world in exchange for worship. This picture has to do with this particular temptation. I thought it was interesting. In this photograph, the Temple mount is viewed from the southeast, from the Mount of Olives. To the west of the Temple was the Tyropoeon valley and to the south and east was the Kidron valley. "The high point of the Temple" could be the southeast portion of the outer wall, since ground level would be the bottom of the Kidron valley, thereby making it the highest point of the Temple measured from the level ground to the top of the wall. According to Josephus, if one stood on the roof of the Royal portico and looked down into the Kidron valley one would become dizzy, so great was the height. wilderness in complete obedience to the commandments, and in particular, fasting without complaint, whilst the Jews in the wilderness incessantly complained about the food they ate. To conclude, I don't think that one of these options sufficiently answers the question by itself. I feel most confident in figuring the answer to be a combination of the first three options. 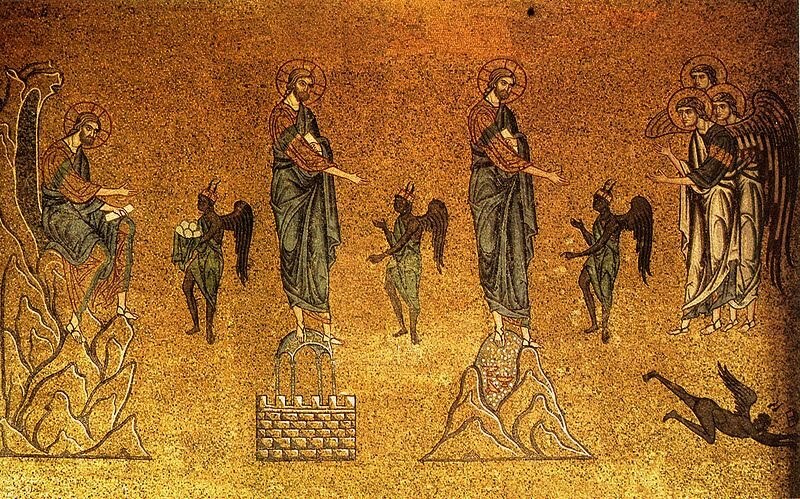 Through these temptations, Jesus practiced fleeing sin so that when temptations came, he wouldn't be prone to commit sin, which would disqualify him as the Davidic Messiah and not fulfill I Corinthians 15:22, which would completely alter the outcome of mankind according the literature of the gospels Matthew, Mark, and Luke.